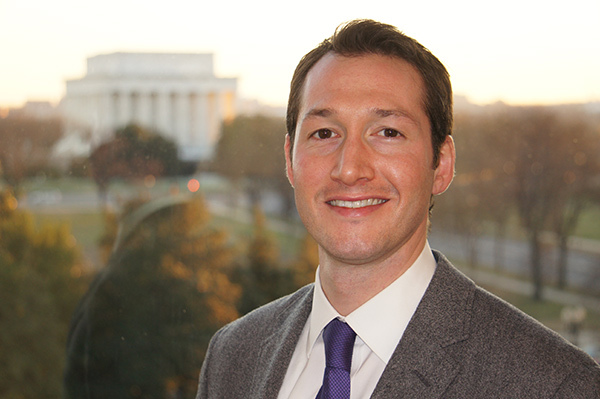 Jarred Butto, AM '07 came to the School of Social Service Administration with the idea of combining social work with his interest in international relations, and he credits Washington Week—and SSA alumni—with helping him find the connection. Butto is a Program Officer with the U.S. Department of State's EducationUSA network, which provides support and guidance for international students at advising centers in more than 170 countries around the world. His position combines policy and on-the-ground work. "Our advising staff works with international students to help them gain access to educational opportunities at U.S. colleges and universities and navigate the complex admissions, process" he said. Butto's work also involves coordinating his office's outreach to U.S. higher education institutions and providing services to support the development of international student recruitment strategies on campuses across the country. His focus on international programs began when he was a Rotary Scholar in Japan during high school. He returned there for two study abroad semesters while a student at Bucknell University, where he majored in East Asian Studies and Anthropology. He again went to Japan after his college graduation to teach English for a year. He credits those early transformational experiences with inspiring his interest in cross-cultural programs. Butto, who worked at a small foster-care agency in Pennsylvania before beginning his SSA studies, has high praise for SSA's resources, programs, and flexibility. He notes that access to the world-class faculty and field instructors at SSA and across the University of Chicago is among the program's major strengths. "Students are exposed to a wide variety of academic and professional opportunities at SSA and these diverse experiences and world views help to inform decisions about our personal and career trajectories." In reflecting on other factors that spurred his interest in work abroad, Butto noted both SSA's International Social Welfare Group and the international, cross-cultural analysis of social service interventions he conducted in the classroom with Associate Professor Robert Chaskin nurtured his growing interest in international themes within social work theory and practice. He also praised the diversity of field placements. His first was at a community health clinic in Pilsen, where he said the language barrier he encountered working with a largely immigrant population "taught me what it means to provide service in a multicultural community." In his second placement with the American Friends Service Committee, he brought together three perspectives on the Iraqi War—returned veterans, Iraqi nationals, and academics—for a symposium that offered the first open dialogue for members of these groups in Chicago. Butto speaks highly of SSA's flexibility. "When I enrolled, I didn't know whether I wanted to pursue a clinical or policy track. SSA gave me the opportunity to explore both until I discovered that my international work was leading me in a policy direction. After settling on policy work, participating in Washington Week was a logical next step." To make the most of Washington Week, he networked with alumni before and during the experience. He reached out again when he began his search for employment after graduation. "SSA has an ever-growing community of alumni who support each other. Our alumni offered guidance, hosted me for informational interviews, and even sent me job postings based on my interests. One of those postings led to my first position." Based on his own success with Washington Week, Butto made a commitment to support the annual initiative. He meets as many students as possible during the opening reception, and hosts a group of SSA students in his office. "More SSA students have the chance to explore international applications for social service work as SSA's internationally focused curriculum has evolved. As the world becomes increasingly interconnected the line between domestic and international policy continues to blur. It's exciting to see SSA at the forefront of the internationalization of our field." To today's students and those considering applying to SSA, Butto notes, "Two years for a master's program may seem long when you are in the middle of finals and a Chicago winter, but in retrospect, it goes by in the blink of an eye, so take advantage of your time and enjoy."